En Sabah Nur, a.k.a. Apocalypse, is one of the most dangerous villains the X-Men have ever encountered. The team of brave mutants have taken on quite a few threats over the years, so that’s pretty high praise for the big and blue baddie! Now, the powerful threat is going to make his big screen debut in Bryan Singer’s X-Men: Apocalypse. But before the new comic book movie opens in theaters, we’re teaming up with 20th Century Fox to give you the chance to meet some of the young X-Men from the film! 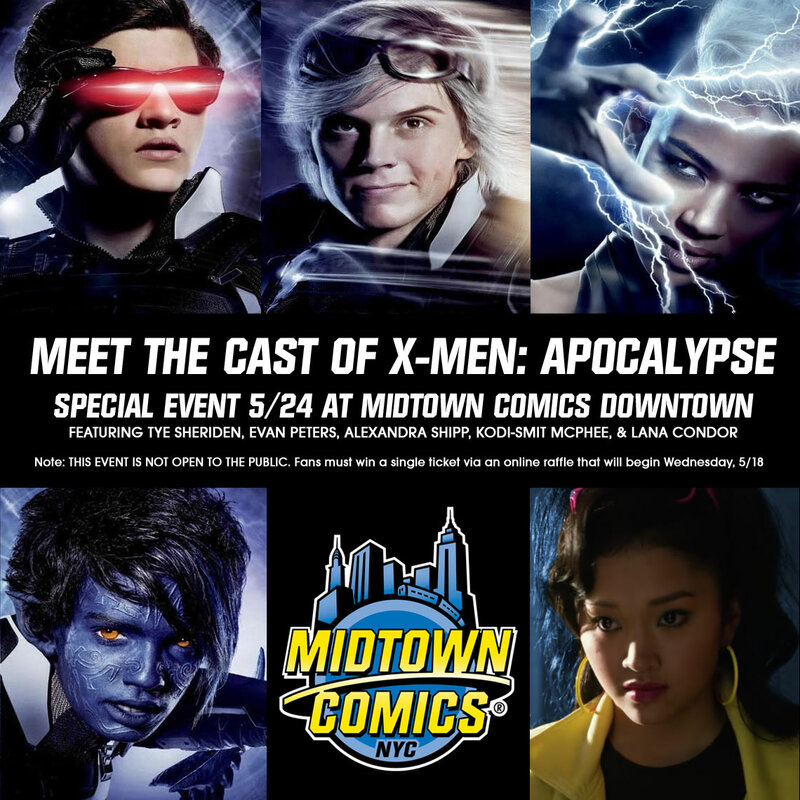 Visiting Midtown Comics Downtown will be Evan Peters (Quicksilver), Alexandra Shipp (Storm), Lana Candor (Jubilee), and Tye Sheriden (Cyclops) to sign X-Men: Apocalypse posters! Want to win a ticket to the event? Enter below! This is a limited signing event. You may only attend if you win a ticket via the raffle below. Free posters will be provided for the ticket winners at the event. Okay, ready to test your luck? X-Men: Apocalypse opens May 27th. Contestants must be in or near the New York City area – travel and lodging will NOT be provided. Good luck, everyone! I really hope I win! ! I’m the biggest X-Men fan out there! Xmen Rocks it would be an honor to meet the cast . Would love to meet cast of Xmen it would be an honor to meet them. Movie looks amazing, would love to meet the cast! Would love the opportunity to meet this cast! I love x-men so much, as a kid I watched all the movies and read the comics. It would be an honor to win a ticket!!! I would also love to meet Evan peters and the rest of the cast that will be there! So excited for this movie, i already know it will be my favorite xmen movie and i love the cast, they are all amazing. Just another fan who is super excited for the movie and lovs the cast. Just another fan who is super excited for the movie and loves the cast, they are all amazing! Fantastic opportunity all cast Rocks! Hope I win I’m so excited !!! Please pick me !! I’m dying to meet Evan Peters!!! i will call out of work to meet Evan Peters!!! How many message do I have to submit to win?!?!?! #IllLoveToMeetEvanPeters.